SRAM's long-rumoured 12-speed groupset has finally been released, a new system known as AXS (pronounced 'Axis') that features revised gear ratios, a flat-top chain and a number of other innovative features. Bicycling Australia took the first images (above) of the groupo fitted to the Trek-Segafredo team bikes at the Tour Down Under in January. Being used by the men’s and women’s teams, the groupsets were closely guarded by team staff and key components were masked with black tape. On February 7 SRAM launched final details of the drive system that features a number of revolutionary changes. Most notably, the groupset is available in 50/37, 48/35 and 46/33 front chainrings, with 10/26, 10/28 and 10/33T cassettes. Known as 'X-Range' gearing, SRAM say in moving some of the gear range from the front of the drivetrain to the back, they’ve employed a smaller, consistent difference (13 teeth) between the chainrings while giving the cassettes wider range (up to 10-33, or 330%). "That means you can stay on the same ring longer, requiring fewer front shifts which are inherently less efficient than rear shifts," say SRAM in the product release. "And when a front shift is executed, the smaller jump is smoother and allows you to get to the right cadence with fewer compensation shifts in the rear. Fewer, faster front shifts makes it easier for you to find the right gear, and that’s a distinct performance advantage relative to traditional drivetrains." With all cassette's starting with 10T, the cogs and chainrings are smaller overall, eliminating the potential weight gain of a wide-range 11-tooth start. "The smaller package reduces system complexity," say SRAM. "Only one rear derailleur is required to cover all our chainring and cassette combinations. So, if you’re a flatlander who likes a tight-range cassette, you only need to swap your cassette and chain for a mountain tour. With X-Range, getting everything you’ve always wanted in a drivetrain has never been simpler." SRAM have also re-designed the chain, incorporating a flat-top design into the new AXS system. "To gain a wider gear range with smaller gearing steps, the chain has to get narrower," they say. "With Flattop, we’ve added material on the flat side of the chain plates to strengthen every link. The Hard Chrome surface treatment on the pins, inner plates, and rollers also extends the life of the chain and keeps it shifting precisely over the long haul. Additionally, Flattop chains feature longer wearing large diameter rollers that help deliver the same drivetrain efficiency as our 11-speed drivetrains. All of these technologies together have enabled us to engineer a narrower 12-speed chain that lasts 36% longer than our 11-speed chains." The upgraded system now features a hydraulic damper system known as 'Orbit'. This is designed to reduce chain bounce by controlling the chain’s downward movement when riding over bumps. "Orbit is a new, patented design that consists of a silicone fluid damper with a one-way valve that controls the rear derailleur cage’s counter-clockwise rotation," say SRAM in the product notes. "This prevents the lower derailleur pulley from moving forward when bumps in the road cause g-force spikes that pull the chain downward. The damped cage rotation keeps the drivetrain quiet and helps prevent the chain from derailing off the chain ring." The SRAM AXS 12-speed groupset is available now, with the retail price listed at around the $4000 mark. Over To You - Your Thoughts On The Latest From SRAM? 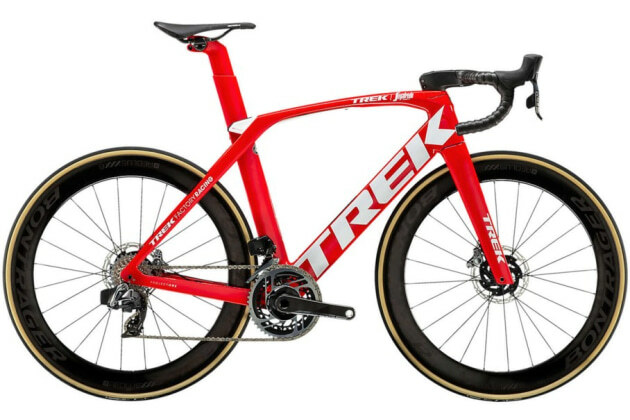 A Trek Madone as fitted with new SRAM eTap.